I was born and raised in Northern New Jersey. My parents still live in Tenafly, NJ, are happy and healthy, and are fabulous grandparents to our two boys – Nicholas (23) and Alexander (20). Nick works on Wall Street and Zan is a sophomore at LMU in Louisiana. My wife Lynn and I started dating when I was in the 10th grade and she was in the 9th grade – and have now been married for 26 years! What is your favorite Team Boomer memory? I love the Team Boomer camaraderie, the incredible cause the Team supports, and the inspirational stories of fellow runners and of those dealing with the hardships of cystic fibrosis. Training is always a grind – but so much easier when affiliated with great people and a great cause. Personalize each fundraising message – don’t use a “one size fits all” appeal. Take the time to write individual emails with your Firstgiving link attached. People want to feel appreciated, so the individualized dialogue helps. As the donations comes in, immediately respond with a personalized thank you email. Set up a group email that includes ALL to whom you have appealed for money. Immediately after the race is complete, send a group thank you that recaps the entire event, describe the merits of Team Boomer and the Boomer Esiason Foundation, and how important the donations are. Periodic training updates to the whole group are nice too – especially 2-4 weeks before the race…. And can be a subtle reminder to those who haven’t made a contribution yet. My sister ran two marathons – much faster than I have – and that got me interested. I enjoy the challenge, the need to focus, and the great cause that Team Boomer serves. I am also in my fourth year of recovery currently, completely committed to my sobriety, and find that the mental and physical fitness are an integral part of maintaining it. 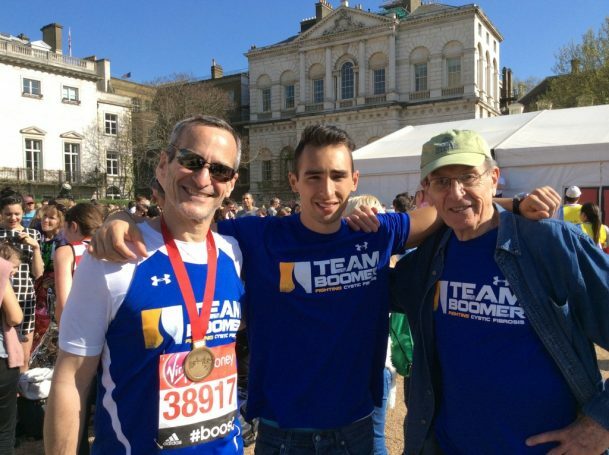 I am grateful to Team Boomer for all of the incredible support and for serving such a fabulous cause – and I look forward to my next race!